Carnival in Venice. 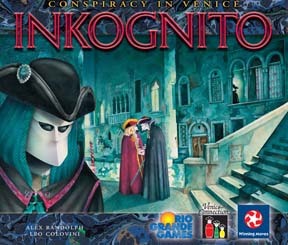 The players take on the roles of secret agents, disappearing into the wild, festive confusion behind the masks of carnival â€“ intent on fulfilling a secret mission. But first, they have to identify their partner, for only together can they find out which mission awaits them. But who is this partner? At each encounter, you learn a little bit more, piecing together information while you try to avoid misdirection and heading on the wrong track.